Scrappy private lenders increased market share last year as small balance commercial originations volume soared to $180 billion. 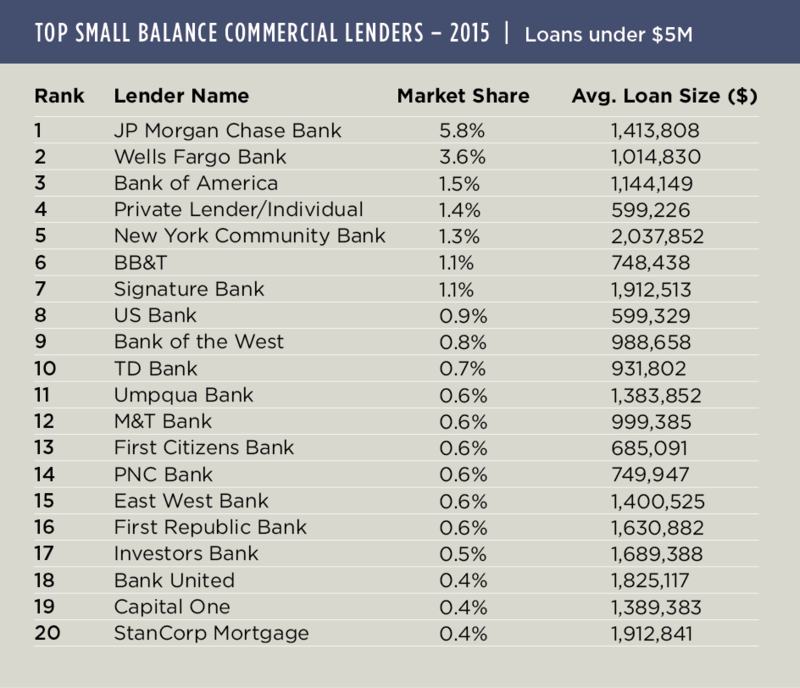 In this increasingly competitive marketplace, private lenders and individuals grabbed a 1.4% share of the dollar volume for commercial and multifamily loans under $5 million - doubling their stake from 2014 - and elevating the group to fourth from 11th place among the top 20 SBC lenders. See the nearby league table. JP Morgan Chase Bank, ranked #1, was the only other entity to post a material improvement with a year-over-year gain of 74 basis points for a 5.8% share. Overall, the top 20 lenders increased their collective share by 132 basis points last year to 23.4%. In so doing, these leaders, nearly all of which are national and regional banks, exercised collective muscle to win modest-sized new deals with competitive rates and terms, and retained others via depository relationships. Nevertheless, the rise in private lending underscores the challenges that small balance borrowers face in certain parts of the country where asset values have not sufficiently rebounded despite the general CRE recovery, or otherwise the sponsor's credit is impaired and/or the properties are in a transitional stage. As a result, many small balance borrowers have pursued alternative debt sources such as bridge financing. Regarding the asset valuation gap, Boxwood's Small Commercial Price Index (SCPI) indicated that, as of December, national small cap CRE prices had recovered 60.2% since the end of the financial crisis but remained 8.9% below the previous 2007 peak level with still sizable losses in many markets hit especially hard by the recession.